The first high speed VEKA Catamaran for the Offshore Wind Farm industry has been delivered to Royal Wagenborg. The new catamaran will supply remote wind farms in the North Sea with crew, equipment and supplies. Later this week VEKA say they will launch a second catamaran for its shakedown cruise, and it will not be long before this one will also be heading out for the same kind of work. 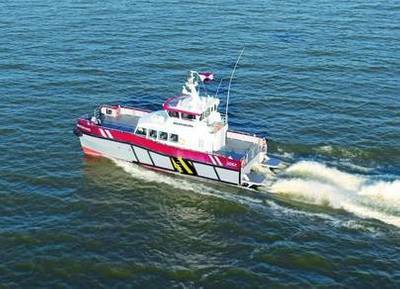 Last year, VEKA engaged in a collaboration with BMT Nigel Gee, for the development of a series of powerful catamarans, They add that they cater for a strong demand in the market for fast and safe transport of personnel, technicians and equipment to and from offshore wind farms.